Reena’s story, which Dhillon told at the Wilson Center alongside a panel of health and nutrition experts on July 28, is not one of infectious disease or an incurable illness, but of maternal malnutrition and its lasting effects across generations. Globally, malnourished mothers give birth to as many as 17 million underweight infants a year, according to the World Food Program. These children often face health and development challenges throughout their lives as a result. Ending structural malnutrition is a matter of addressing not only shortfalls in food security, Dhillon said, but also empowering women and improving health care systems. To understand why Reena was so sick, one has to look at the health of her mother, especially her nutrition, said Dhillon, a global health expert from Columbia University and Harvard Medical School who has worked on strengthening health care systems in India and other developing countries for more than a decade. Reena’s mother was undernourished well before her pregnancy and consequently suffered from iron-deficiency anemia, a condition that can be remedied relatively easily through diet changes but otherwise increases risks for low body-mass index levels, health complications, and even death during and after pregnancy. Worldwide, approximately 468 million women between 15 and 49, or 30 percent of all women, are believed to be anemic, at least half because of iron deficiency. Besides these risks to their own health, anemic mothers are also more likely to give birth to a child that suffers from stunted physical and cognitive development and low birth weight. Maternal malnutrition accounts for 20 percent of child stunting globally, said World Food Program Senior Policy Advisor Tanuja Rastogi. Combatting the effects of malnutrition requires a “continuum of care” approach, said Frederika Meijer, UNFPA country representative for India and country director for Bhutan, in which mothers and children are targeted with specialized treatment in each stage of pregnancy and development. There is a 1000-day window, stretching from the start of pregnancy through a child’s second birthday, that is particularly important for the nourishment of mothers and children, said Rastogi. This cycle also reinforces another – that of poverty. Children who don’t receive adequate nutrition at a young age often lag behind in school and suffer worse health outcomes, limiting their ability to support themselves later in life, she said. Reena, a seven-month-old born to low-caste parents, was in the midst of both these cycles. But she and her mother also faced a stacked deck because of their gender. Reena’s father passed away sometime after her birth, sending her and her mother’s social standing and purchasing power – already low – plummeting even further. Another team of doctors, also unwilling to treat Reena’s malnutrition, explained to Dhillon, “these people, this is how they die.” It was only through Dhillon’s lobbying on her behalf that Reena was eventually admitted to a private hospital, where she recovered. The rights to complete an education and make reproductive and sexual health decisions are not recognized for many women and girls in India. Forty-seven percent of girls get married and 30 percent give birth before they turn 18, said Meijer. Mothers are also often unable to make decisions about pregnancy care and how finances are allotted towards food and health care for their children. “Just because you have access to food, for example, doesn’t necessarily mean that you have the decision-making authority within your household or within your family to distribute the food,” said Corinne Mazzeo, a health and nutrition advisor at Childfund International. There are some facilities that poor, low-caste women like Reena’s mother are able to access, explained Dhillon, but these facilities have very limited capacity, are regularly flooded with patients, and as a result, generally provide poor care. He explained a litany of mistakes he observed during his time with Reena: antenatal care physicians at a community clinic failed to supply Reena’s mother with enough iron and folic acid supplements during her pregnancy; the primary health center several miles away did not test Reena for malnutrition; and staff at the larger public hospital in a neighboring town admitted Reena to the malnutrition ward but were not properly trained to treat her. India boasts nearly one third of the global low-weight birth cases and 38 percent of the global stunting burden, said Meijer. 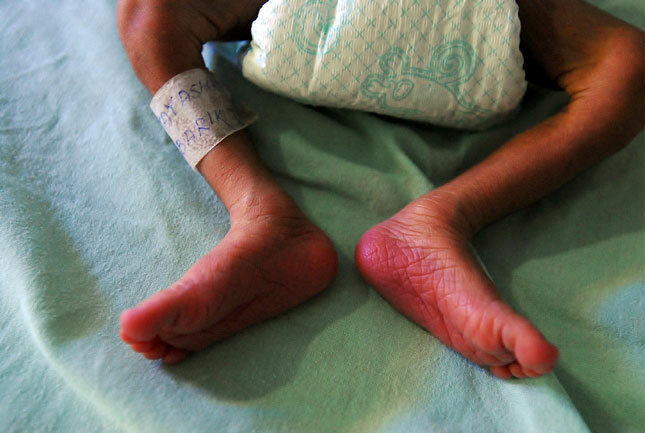 An astounding 22 percent of newborns have low birth weights. Policymakers have long tried to meet the Millennium Development Goals on child mortality and maternal health by working towards universal health coverage, said Dhillon. But to ensure wider delivery of much-needed services for mothers and children, he suggested focusing more specifically on women’s empowerment and nutrition. Drawing from their work in India, Egypt, and Senegal, among other places, the panelists offered different strategies to adapt health systems to meet the unique nutritional needs of women before, during, and after pregnancy and accommodate the challenges they face in their homes and communities. Justine Kavle, a senior program officer for nutrition with USAID and PATH’s Maternal and Child Health Integrated Program, stressed the importance of counseling and information services to help women incorporate the right foods into their diets. Meijer called on governments and development donors to boost the capacity of community health workers. Mazzeo pointed out the need to engage male partners. And Rastogi highlighted the usefulness of nutrition-sensitive programs in schools and employment programs, as well as cross-sector partnerships (for example, recent research has cast light on the value of addressing nutrition alongside water, sanitation, and hygiene in urban India, since poor sanitation and malnutrition reinforce each other). The panelists also cautioned policymakers to look closely for “gender gaps” within existing approaches. For example, providing nutritious lunches in schools is a popular approach to reaching adolescent girls, said Kavle, but if girls – particularly those from the lowest rungs of society – are dropping out of school, then they won’t benefit. Similarly, mobile phone technology is widely touted as a way to reach women who are unable to travel to clinics or leave their homes without male supervision, but women often lack the privacy necessary to use cell-based health services, said Mazzeo. Sources: World Food Program, World Health Organization. Photo Credit: Infant Survival Unit in Indian Hospital, courtesy of Pippa Ranger/U.K. Department of Development.